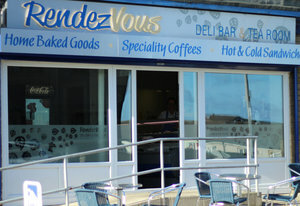 Being established and highly regarded for a number of years, Rendezvous Deli Bar & Tea Room at 526 Huddersfield Road, Wyke, is a Deli Bar with a difference, offering high quality freshly prepared sandwiches, homemade meals, savouries, cakes and snacks in a warm and welcoming atmosphere. Along with our delicious homemade food we also serve hot and cold drinks including freshly ground Lavazza Italian coffee and speciality teas. So why not visit us and try our Full English Breakfast, or one of our Hot Roast Beef & Onion Gravy Baguettes or Hot Roast Turkey & Stuffing Baguette, or for something a bit different please order one of our homemade specials such as Chicken & Spinach Curry, Corned Beef Hash & Giant Yorkshire, Spicy Sausage Casserole, Chicken Burritos, Potato & Peas Keema, Cornish Pasty with Mushy Peas & Mint Sauce, Lasagne or Chilli. For something lighter why not try one of our delicious homemade soups, either Leek & Potato, Broccoli & Cheddar, Cream of Mushroom with a Hint of Garlic or Tomato & Mixed Pepper, or for the sweet tooth why not try some of our homemade Lemon Drizzle Cake, Bakewell Tart, Marble Cake, Lemon Cheesecake or Fresh Cream Scone with Jam. If you're just passing by and looking for a friendly place to relax with a hot drink, why not try a cup of our freshly ground Italian coffee. Our customers can also browse the internet courtesy of our Free Super Fast WiFi or simply just relax with a free newspaper, or maybe even enjoy some friendly banter with one of our team (pictured above^) or one of the many Rendezvous regulars. Our meals and soups are homemade using fresh ingredients, herbs, spices and sauces. All our sandwich fillings are made up on site from fresh ingredients and our bread is spread with the finest lurpak butter. 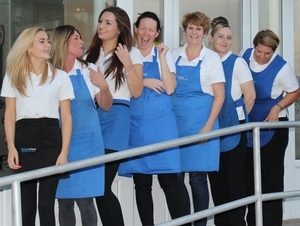 All our beef, turkey, ham and chicken is prepared, home roasted and sliced fresh on site. Our jacket potatoes are baked on site in our dedicated potato oven - choose from a delicious selection of various toppings.